Like Bernard Selwyn (see this post among several others), our other chronicler of Chelsea (and other places), JW (Bill) Figg took his camera to work, and the locations he visited gave him access to some unusual perspectives. We’ve already seen his pictures of the interior of Lots Road Power Station. This week we’re following him onto the roof. 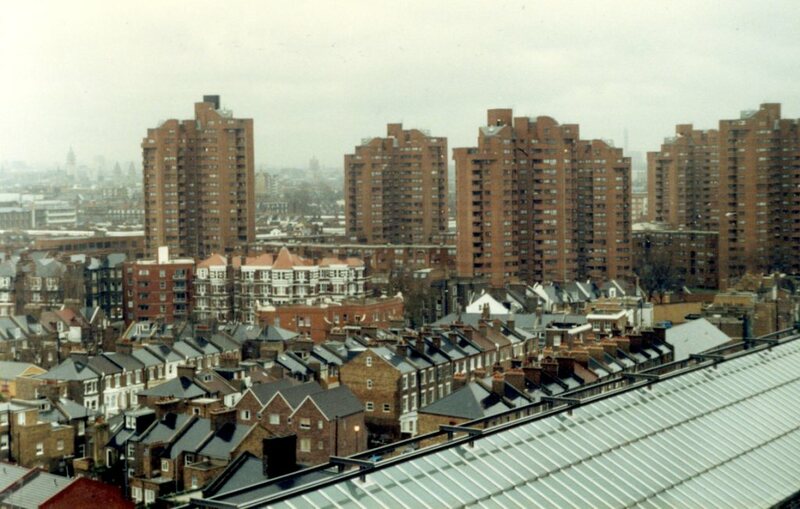 In this picture (he’s looking north east I think) across the streets of terraced houses near the Station towards the World’s End Estate. I suspect this is about 1977. Here he zooms in a little. The estate wasn’t the only thing he could see from his vantage point. 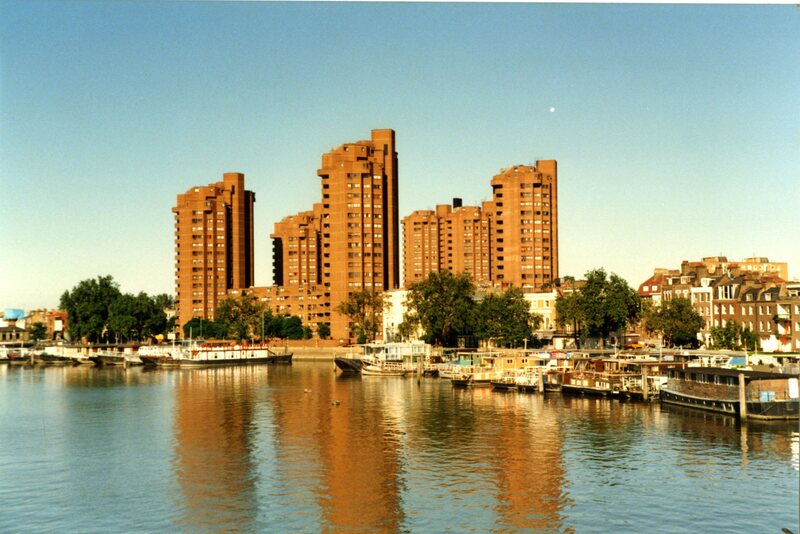 Here, he looks down at the river and some of the buildings on the bank. Note that single car parked right at the end of the jetty. (Why drive all the way to the end?) The short section of ramp puzzled me for a while because I was sure someone had told me exactly what it was in a comment on another post. And they had. Here’s a link to the post and a thank you to Roger Morgan. 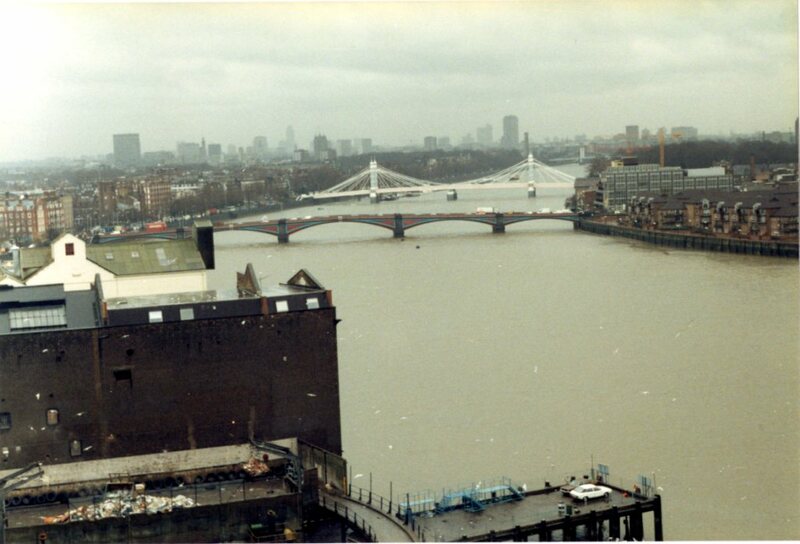 Below , the view also takes in both Battersea and Albert Bridges, with Battersea power station in the distance. Coming down from his vantage point, Figg also took pictures from the other side. 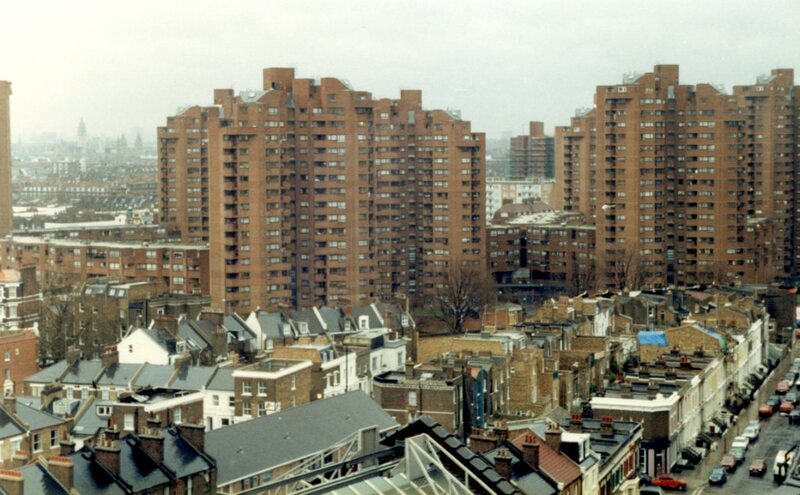 On a far more sunny day, the World’s End Estate from the south, including the houseboats at Chelsea Reach and in the background the Cremorne Estate. Below, the Wharf buildings, including what must be the two chimney version of the power station, with the furthest chimney hidden by the angle of the shot. The water looks deceptively calm and pleasant. 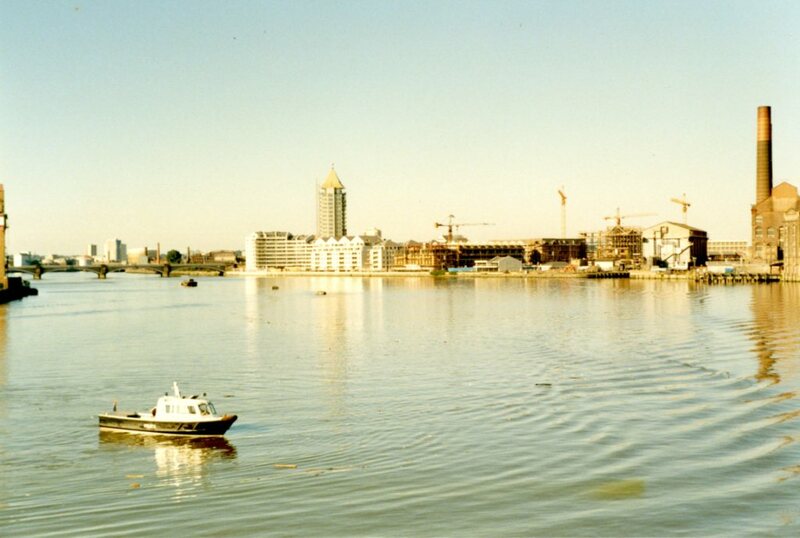 This tranquil view across the river as it curves around the bend towards Wandsworth and Putney shows the railway bridge and the completed Chelsea Harbour development. 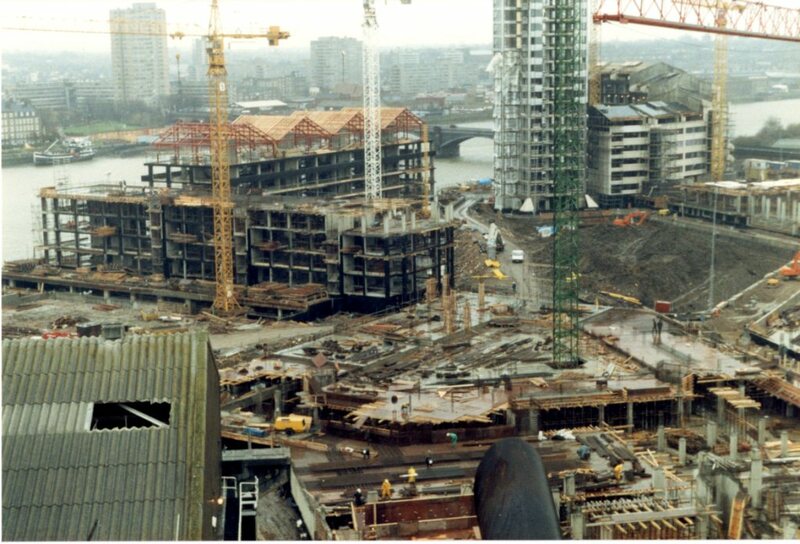 These pictures date from the 1990s, but Figg had been keeping an eye on the development for a while. He must be back on the roof of the power station for the next series of images. He dates this one (and presumably the others) 1989. This section was just a muddy hole with a temporary car park at this stage. 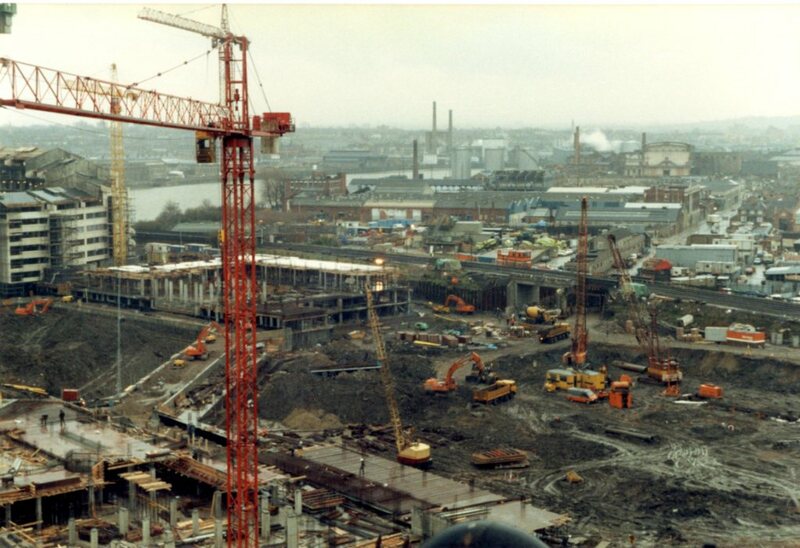 The buildings soon emerged from the mud. I’m not entirely sure what this one is. I’m sure someone can tell me. 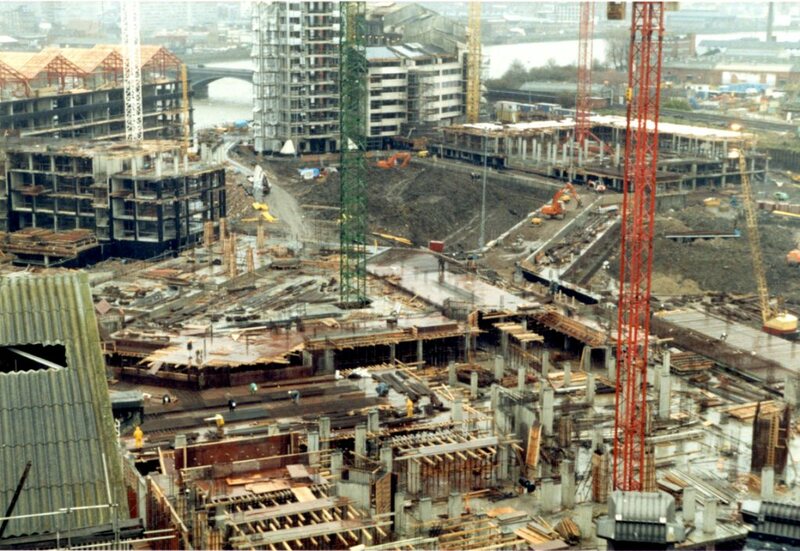 Here you see the overall structure taking shape as the development grows. The completed Harbour seemed a remarkably optimistic piece of work when it sat there on its own at the end of the increasingly gentrified Lots Road, but since the tide of development has moved along Townmead Road through Imperial Wharf, with new housing and retail development, and a new railway station it looks like the first outpost of a new urban riverside strip heading towards Wandsworth Bridge, with similar developments on the south side of the river. Figg is still on his perch when he looks north again. In the distance, Chelsea Football Stadium. Immediately below, I’m tentatively identifying the street as Tettcott Road. 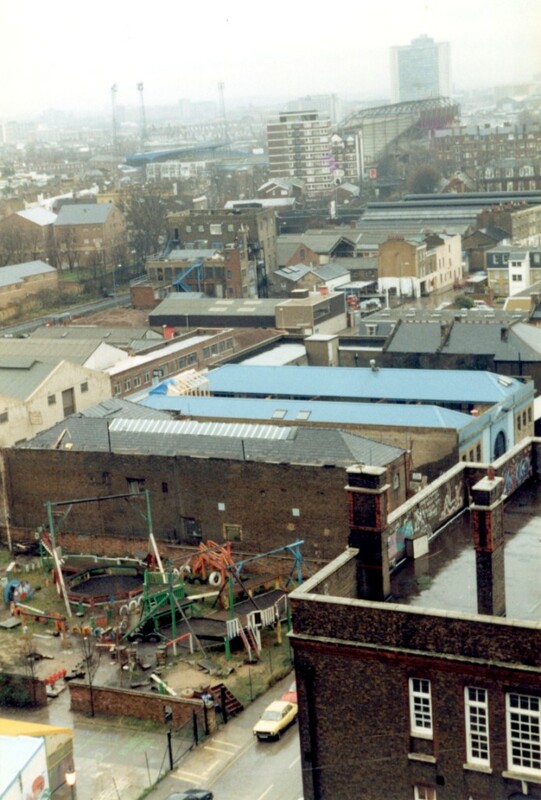 Follow its path past the ramshackle adventure playground to the blue building which I think is the Fyna Works, which was pictured at the end of a previous Figg post. When you read the title, Figg’s World’s End, I imagine you thought it would involve images like this one. 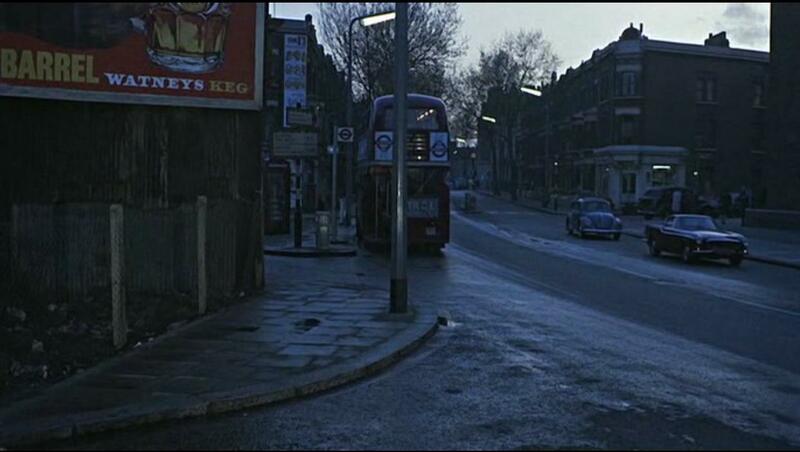 A rare colour view looking up Dartrey Road, one of the lost streets of the World’s End at the King’s Road. Or this view of St John’s Church. We have seen picture like that before, but this one is a bit of an scoop. 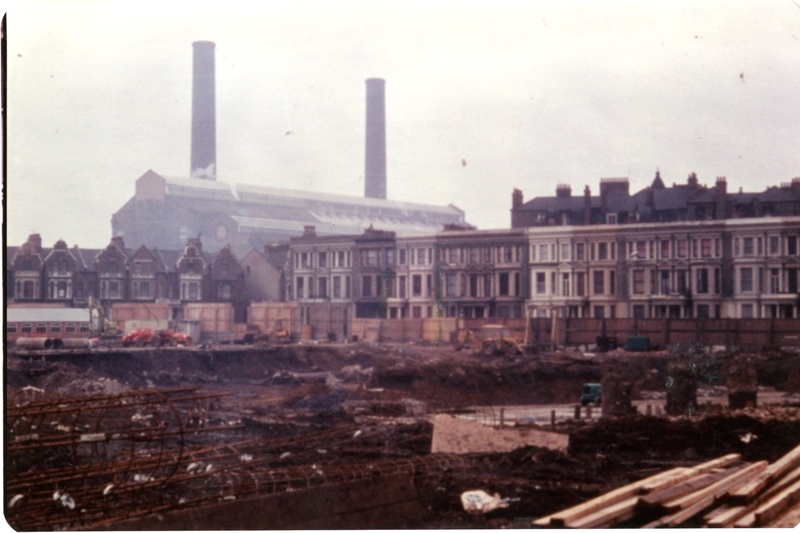 This shows the power station looking across the cleared streets where the World’s End Estate was built. A unique image in our collection. Finally, one for World’s End enthusiasts like friend of the blog Mr Chris Pain. I’m pretty sure this is a view of a surviving World’s End building from the opposite direction to the preceding picture. Can anyone identify it and say exactly where it was? A friend of mine came into Local Studies this afternoon as I was finishing up and suggested it might be an antiques shop on the King’s Road but some close work on Google Street View makes me doubtful. Any suggestions? Thanks to all the people who left comments on last weeks post, especially the identification of the cars, and about of the eastern end of Kensal Road. You all add immeasurably to the character of the blog, and its usefulness as a source of information. We’re enjoying a bit of a surge in page views at the moment (post-Christmas energy?) so welcome to anyone who’s just started reading. There are plenty of links this week to take you back to older parts of the blog. I haven’t done any death notices for a while but I must note the passing of Peter Wyngarde announced this morning. My first reaction was surprise that he hadn’t died years ago, which is a bit mean but it is a common phenomenon. I was a fan of all those ATV shows in my teens, not just Department S but also the Champions, Randall and Hopkirk, the Baron etc. I can also admit to turning back my shirt cuffs over the cuffs of my jacket (yellow shirt, black jacket – it was the 70s) on at least one occasion and having a younger boy from next door shout “Jason King” at me. TV aficionados will also remember Wyngarde in that Hellfire Club episode of the Avengers (despite the memory of what Diana Rigg wore in that episode). I actually met Wyngarde on a couple of occasions when he came into the library, usually to borrow the text of a play. He died at the Chelsea-Westminster Hospital so perhaps he remained a local boy. Thank you, Peter. 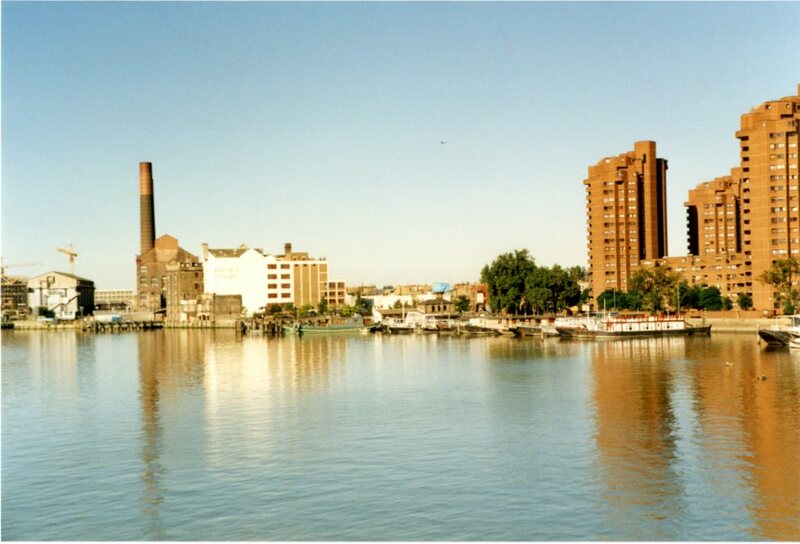 This entry was posted on Thursday, January 18th, 2018 at 10:19 am	and tagged with Chelsea Harbour, J W Figg, Lots Road Power Station, World's End and posted in 20th Century, Chelsea. You can follow any responses to this entry through the RSS 2.0 feed. Final Picture – well it’s a pub (unbelievably). The only buildings left standing in comprehensive redevelopments were pubs (I have a feeling they were protected from compulsory purchase). And the sign above the window has a central word ‘Trumans’. With a lens on the other two you may be able to make them out. I don’t like that lamp post – it doesn’t look very K&C. Bing Maps oblique views are good for scanning an area for a building – I have had a brief look and can see nothing. Perhaps it was demolished after all? I think the building WAS demolished. I beleive it is the south end of Dartrey Road, at the Junction with Cremorne Road. 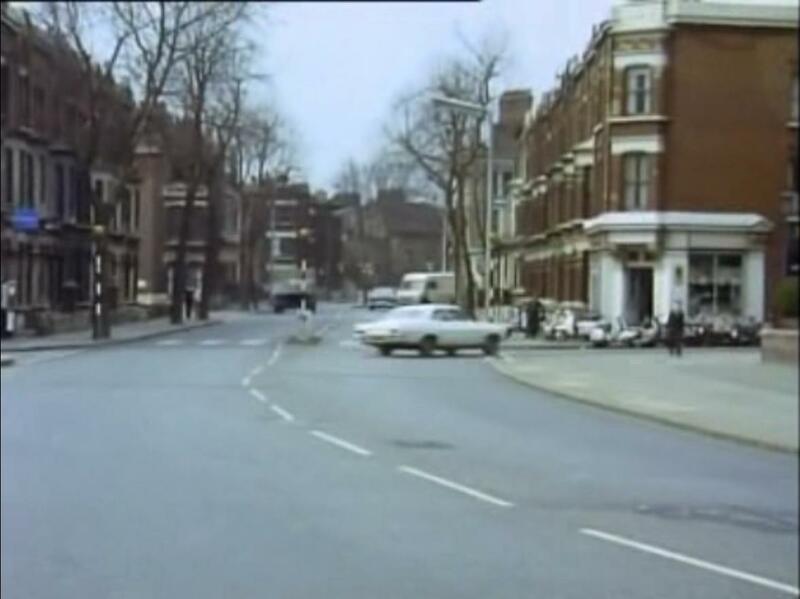 The zebra crossing on the south side, from which the photo was taken, is at the junction of Cremorne Road and Lots Road. On the extreme left, you can see the houses in Edith Grove that are still standing. 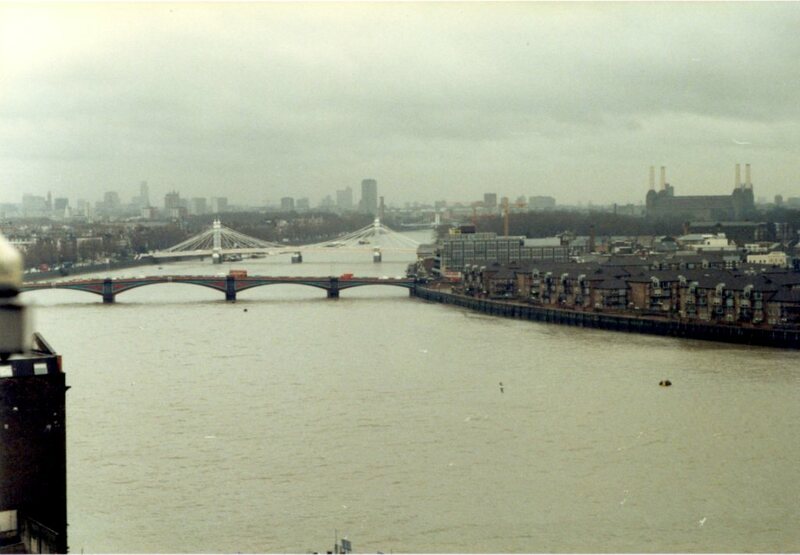 Below , the view also takes in both Wandsworth and Albert Bridges, with Battersea power station in the distance. Isn’t that Battersea, not Wandsworth Bridge? A taxi driver told me the way to remember the order was that coming up river they spell CAB — Chelsea, Albert, Battersea. Incidentally, talking of that end of the High Street. 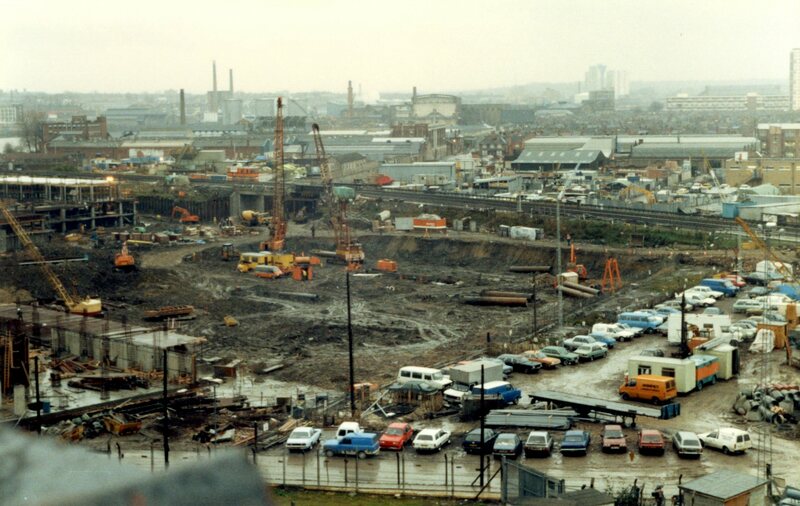 If you recall, the corner of ECR and KHS was for many years a muddy NCP car park. Another older cabby told me that was the site of a V2 missile strike. Might something on the bomb damage during and repairs after WW2 be a topic for consideration? Yes sorry that was just an error on my part. Battersea it is. If memory serves the rough and ready entrance to the NCP car park of which I speak was in ECR about where the doorway to Waitrose is situated and it was down a slope to basement level. It had a surface that was gravel, rubble and mud. There were buildings fronting KHS but the whole of the area behind was levelled. You could see the church. It had all the hallmarks of a bomb site, though whether it was a V weapon or a bomb who knows? I bet that there are pictures in the archive, though. 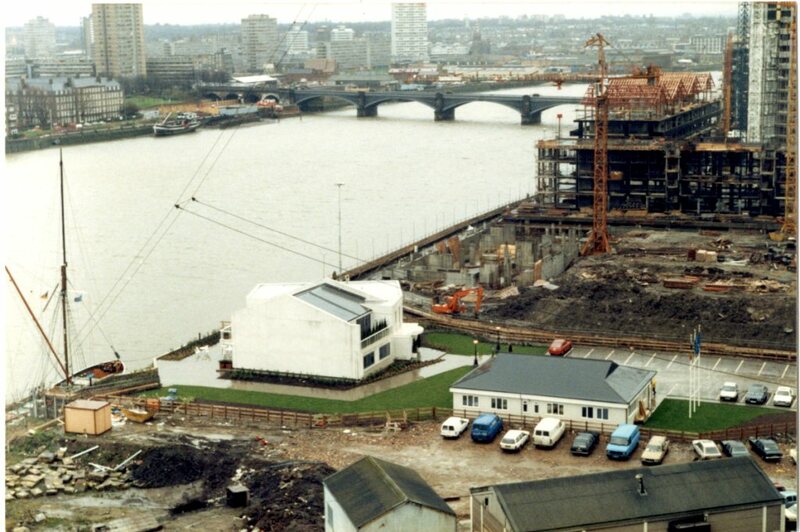 I’ve had a look and have found a picture showing the space where the car park was, behind a set of billboards. There was a gated entrance next to the church which does look as though there was a slope. Vere Hodgson (in her memoirs of the home front) mentions a doodlebug explosion in front of the Lyons restaurant, which she says was “wrecked”. Looking again at later pictures of the restaurant that may account for the odd roof line. One of these days I will put these in a blog post as I haven’t really covered that section of Kensington High Street. The taxi driver who told me about this, back in the early seventies, was old enough to have remembered WW1 let alone WW2. And it was probably my misremembering the turned a V1 into a V2. Thanks for checking it out. Pre-war and earlier 25 inch maps show a density of buildings at the site around a central light well. Hi there!! As a child attending a school off Shepherd’s Bush in the mid 70s we were taken ( some Tuesday mornings ) to a large adventure playground which consisted of a large indoor quarters ( no staircase ) some outdoor wooden climbing apparatus , bushes & trees surrounding all this enclosed environment & this was somewhere in Chelsea – years later I’m still baffled on where this location was & what is it now … and if there were any old pics of the previous playground ? Thanks for this new set of World’s End pictures, Dave. Funny you should mention Randall & Hopkirk. 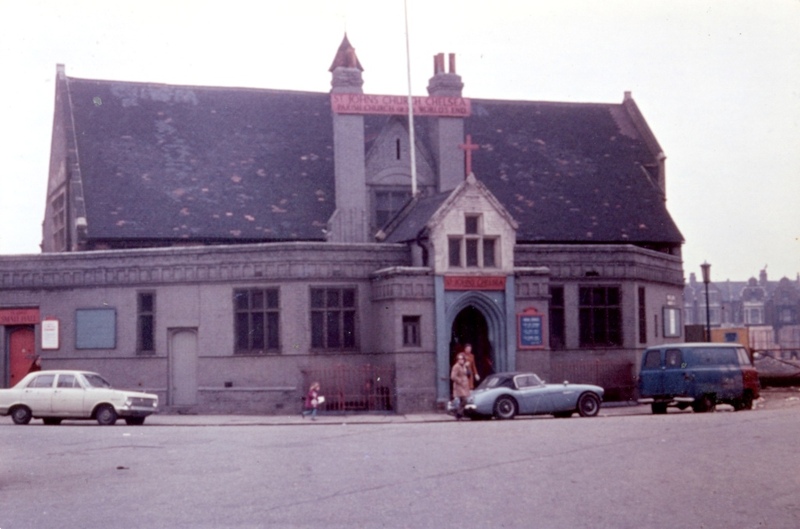 I think this picture, which is actually a still from that particular series, shows the building in the last photograph. Coincidentally, the episode (S01E06, Just for the Record (1969)) was written by a certain Donald James, who we know better as Donald James Wheal, author of the very successful World’s End: a Memoir of a Blitz Childhood. 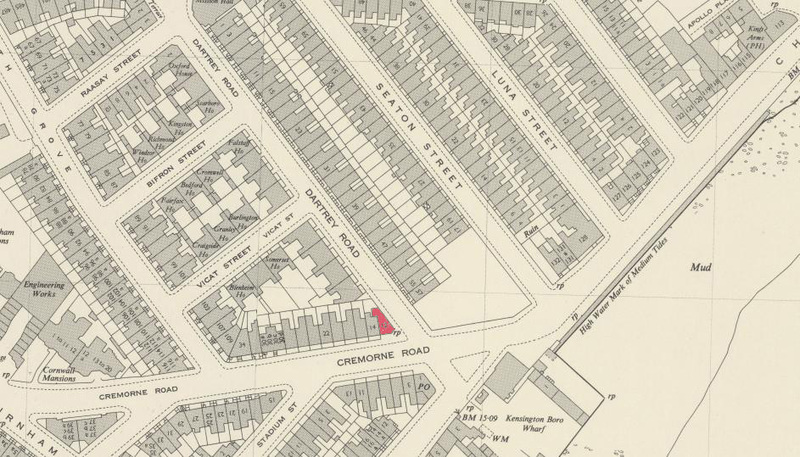 The address of the house and shop was 12 Cremorne Road, on the corner of Dartrey Road. Here’s a map from the immediate post-war period. I’ve marked 12 Cremorne Road in red. Sorry, I forgot to add the link. Somehow I knew you would have the answer…Thanks. And even better you’ve linked it up with Randall and Hopkirk. Here’s another still showing the same building. This is from the 1966 film The Deadly Affair. It’s at the bottom of Dartry Road the river end. 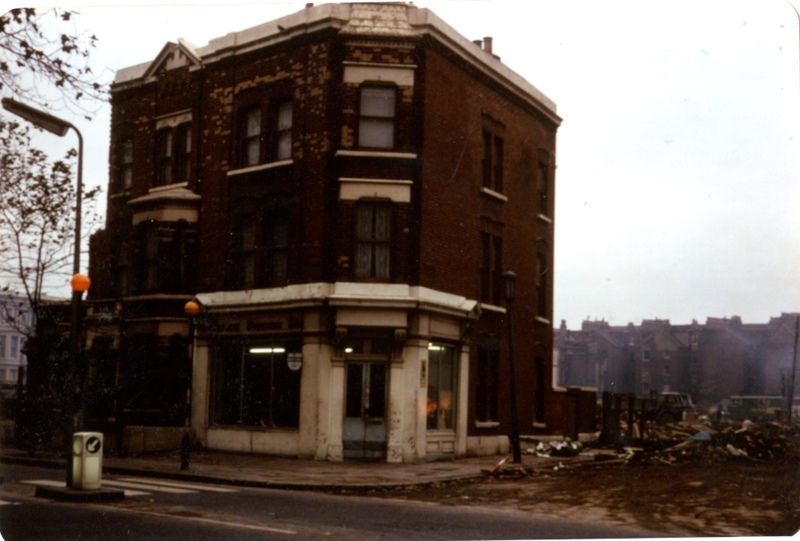 On the opposite side nearest to the river and lots Road was the little post office, sweet shop come newsagents. At one time I think that shop sold motor scooters in maybe the early sixties, the mods and rockers era. Hi. The photo looking up towards World’s End isn’t taken in Dartrey Road, it’s in Blantyre Street. I think you can just make out the name on the street sign. Thanks. I will admit to taking a chance when writing the post – I knew it was one or the other. Sheila, you are right about the scooters and Austendw, it is Blantyre. 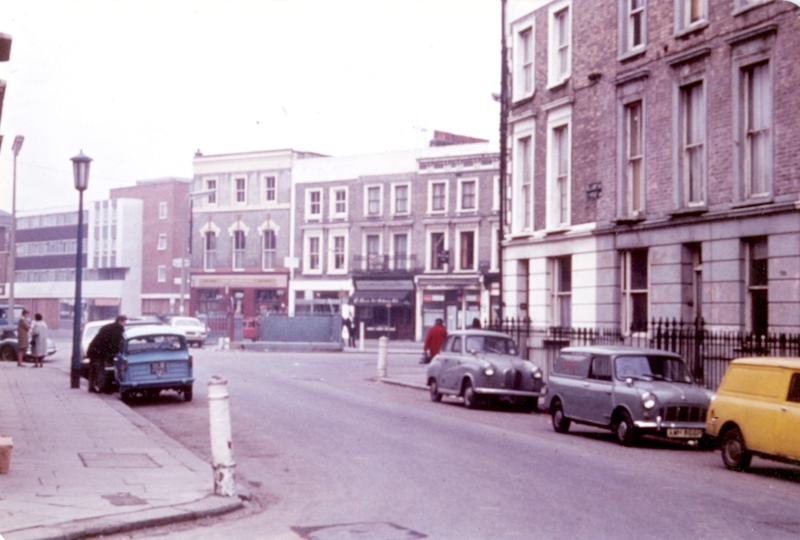 It is just possible that the Austin A35 Saloon parked on the corner was mine, a company car supplied to me in 1958/59 .The house with the white facade next to The Wetherby pub is 498 Kings Road and was full to the brim with nurses from the then St Stephens Hospital in the Fulham Road. Such happy days!Two doors along to the right there was a great Italian Cafe run by a family called Dossi. I went with Tony Dossi to The Salesian College in Battersea, I believe he became a priest. Researching on a building in Paddington. Can I get in touch?